When is Registration for OBOB due this year? OBOB Registration will open on September 1 and will close on October 31. There will be no late registrations accepted. When can my school apply for an OBOB grant this year? OBOB Grant Application for the 2018-2019 year is closed. A student participates by 1) reading from the book list provided for that year’s Oregon Battle of the Books, 2) discussing those titles and 3) competing in battles with their teammates. Make sure your school is registered by the registration close date above. Any school registered in OBOB may send one team per division to their Regional competition. Grant recipients must participate and compete. Students must participate with the school in which they are registered. Teams may not be made up of students from more than one school. Students who are currently home-schooled may participate in OBOB as a member of a school team within the public school attendance boundaries of the school in which the student’s parents reside (as per ORS 339.460 section B, part f). Home-schooled students may not, however, form a team on their own. Home-schooled students wishing to participate in OBOB should contact their local school library for OBOB-related class and/or practice requirements (ORS 339.60, Sec B(e). Home-schooled students may be placed on a school OBOB team at the local level following the same procedures and guidelines used for traditional students. Students enrolled in virtual schools will follow the same guidelines as home-schooled participants. What constitutes a "school" in Oregon Battle of the Books? Virtual School: Students enrolled in Virtual Schools will follow the same guidelines as home school participants. School libraries should have copies of each book on the list. Public libraries, book fairs, and local book stores will also be apprised of the titles and will most likely have them available. The school battles should be completed by the end of February. Reading through the summer is completely optional but OBOB title lists are available to students. Students should have plenty of time to read the books during the school year. How do alternates participate in the regional/state level competition? An alternate may only replace a team member between battles; never during a battle. Players may not be substituted once a battle has begun. No. Many students read only about half of the books. There are a few readers who complete the whole list, but there are some who might only be able to read five of the books. Do I need other schools to have a battle, or can I just have only one at my school? It is best to start small. The first time you conduct a battle, we recommend that you do it alone at your school site. However, it is always good to have other schools in your district or in your area conduct their own battles. Have your school purchase books from the book list and develop an in-house reading incentive system to encourage students to read these books. Request questions for your competition by registering your school in OBOB (via our website) and begin to find sponsors and helpers to support and conduct your local battle at your site or region. May I use the OBOB logo? 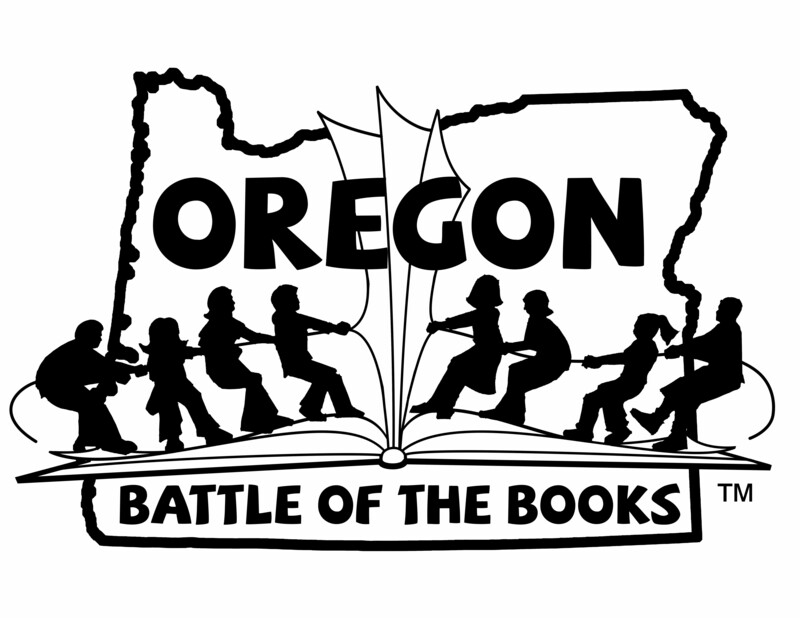 The logo is available for any Oregon Battle of the Books promotional activity, with the proviso that the Oregon Association of School Libraries must be given credit for their sponsorship. Should the logo be used by any commercial entity, the sponsorship credit must be printed somewhere on the same page on which the logo is used. Who else is participating in Oregon? Participants are listed on the OBOB website. You can contact one of the OBOB participants in your area. Do we need to have awards for the winning teams? We suggest that you find ways to honor all participants. If you questions that the information on this site does not answer please contact us. May schools participate in multiple divisions? Yes, schools with three divisions may participate in three divisions. How is a sign language interpreter incorporated into a tournament? The interpreter will stand directly behind the moderator in order to be able to see the question card. As the moderator reads the question, the interpreter will sign the question for your student. We understand that at the regional tournament the question was first read, then signed, then the teams could discuss. This interrupts the normal flow of the battle where the team is able to begin discussion as soon as the moderator finishes reading. The OBOB state tournament committee consulted sign language professionals and the consensus was that an experienced SL Interpreter should be able to sign nearly as fast as the moderator reads. The fifteen second discussion period for your team will begin when the interpreter has finished signing. What region is my school in for OBOB? Note: Region 2 is only divided at the elementary level.